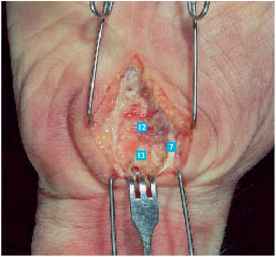 Once you have cut the flexor retinaculum proximal to the wrist, you should palpate the transverse carpal ligament with a hemostat or other similar blunt instrument and feel the grittiness of the transverse fibers. You should also feel the hook of the hamate from inside the carpal canal and then start your transection with the nerve protected. Once you are deep to the superficial fat and the palmar fascia, any further fat that is encountered distally indicates you are already distal to the end of the ligament and are putting the superficial palmar arch at great risk. If the hook of the hamate is not just to the ulnar side of your transection, you are lost too far medially. If you do not see multiple tendons once you go through the fascia, you have gone to the ulnar side of the hook of the hamate and are actually opening Guyon's canal. Proximally there is no risk of getting lost. FIGURE 19—1 (Top Left) The general landmarks for surgical approaches to the hand. 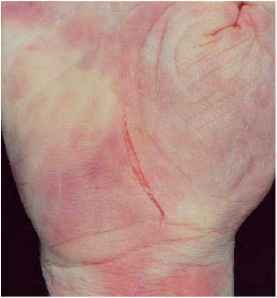 Kaplan's cardinal line proceeds from the ulnar border of the thumb proximal phalanx. The landmark is the deep palmar arch. 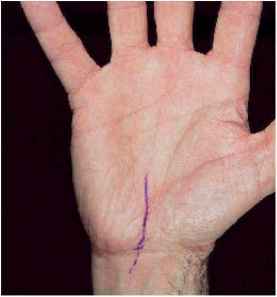 At the intersection of Kaplan's line with a line following the ulnar border of the ring finger lies the hook of the hamate. 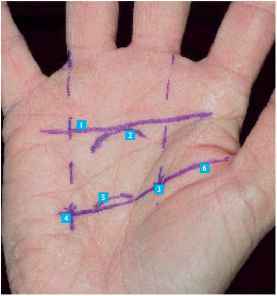 At the intersection of Kaplan's line with a line extended along the radial border of the long finger lies the motor recurrent branch of the median nerve. The transverse palmar crease is the landmark for the superficial palmar arch. 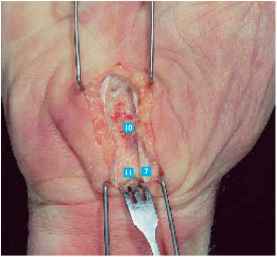 (Top Right) The skin incision for carpal tunnel release. The incision can be extended obliquely and ulnarly across the wrist crease. (Bottom Left) The skin incision follows the thenar flexor crease about 5 mm to its ulnar side. 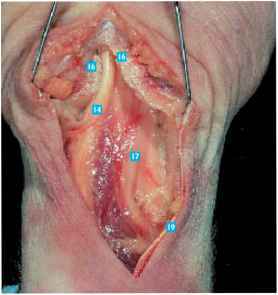 FIGURE 19—2 The palmar fascia after the fat has been separated from it. FIGURE 19—4 The skin being retracted proximally. You can see the palmar fascia and the proximal border of the transverse carpal ligament. The fibers of the palmaris brevis are also visible. Proximally just at the end of the Senn retractor, you can see the flexor retinaculum, which is continuous with the transverse carpal ligament. This will need to be transected proximally for several centimeters in the carpal tunnel release. FIGURE 19—3 The palmaris brevis and the transverse carpal ligament. The proximal end of the ligament is visible. FIGURE 19—5 The transverse carpal ligament, clearly visible. FIGURE 19-7 The view that you would see if you were dissecting to ulnarward. You would still see the palmar fascia in the transverse carpal ligament but you would run into fat before you saw tendons. This indicates you are actually going down Guyon's canal, which puts the ulnar nerve and artery at great risk. Underneath the transverse carpal ligament are the tendons, not fat. 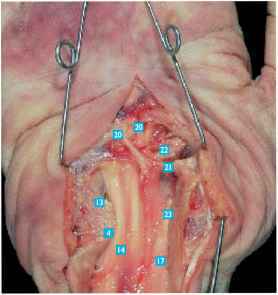 FIGURE 19-6 The transverse carpal ligament after transection. The flexor tendons and the median nerve are clearly visible underneath it. FIGURE 19—8 The proximal expansion of this dissection, showing the median nerve in the forearm, which is distinguished, based just on color and size alone, from the flexor tendons. FIGURE 19-9 The distal dissection. The flexor pollicis longus tendon is apparent on the radial side. The hook of the hamate is seen ulnarward. The branching of the median nerve is also noted. Notice that the sensory branch to the thumb comes off proximal and superficial to the motor branch to the thenar muscles. WHAT IS KAPLAN'S CARDINAL LINE? How do you describe skin opening in the palmar crease?